NAIROBI, April 24 (Xinhua) -- Comoros, a small African country located in the Indian Ocean, is pursuing a total annihilation of malaria, five years after a Chinese-backed project drove out the lethal disease from its two islands. The archipelago nation, which controls three islands of Grande Comore, Moheli and Anjouan and claims sovereignty over Mayotte Island under France's administration, is currently discussing collaboration to achieve that goal in three years together with Chinese scientists, who confirmed this to Xinhua ahead of the World Malaria Day that falls on Wednesday. The Chinese team hopes that the Comoros victory, using a Chinese-developed drug and an unconventional approach, can pave a new trail for the battle against this mosquito-borne disease. Malaria kills about half a million people every year in the world, with Africa claiming some 90 percent of the casualties. Comoros, however, is among the few African nations that now seem ready to shake off this stigma. Song Jianping, who heads the visiting team from Guangzhou University of Chinese Medicine (GZUCM) of southern China, said that they aim to help Comoros annihilate malaria by 2020. Researchers from GZUCM helped administer the 2007-2013 projects with medicines donated by China. They will pinpoint the remaining infection areas and apply small-scale mass drug administration (MDA), said Song, director of GZUCM's Tropical Medicine Institute. For many residents in Comoros, malaria and the horrors it invokes are already becoming a fading memory. Nassurddine Houssen, 51, remembered how his parents used to spend every evening worrying about the cost of buying mosquito coils. Malaria kills a child every two minutes. "During my childhood, I knew many friends (who were) killed by the mosquito disease (malaria)," said Houssen, a resident of Anjouan Island. "My younger sister nearly died from it." "Children died, and we did not know exactly why. Many parents thought it was because of the demon," said Echat Malide, director of Anjouan's Hombo Hospital, recalling a time when malaria affected two thirds of Comoros' population of 800,000 and was the top killer disease on the islands off Africa's southeastern coast. The tides of change began in 2007, when a team of Chinese scientists introduced an anti-malaria project to the island of Moheli before extending it to Anjouan in 2012 and Grande Comore in 2013. On the three islands, it led to a 98-percent drop in malaria cases, from over 100,000 to 1,300 a year, said Chinese Ambassador to Comoros He Yanjun. Unlike traditional methods of killing mosquitoes and preventing mosquito bites, the project asked residents to simultaneously take medicine to flush out the malaria parasites in a procedure called MDA. It builds on the concept that mosquitoes are vectors passing the parasites from person to person. Therefore, if the human "source" is purged, the mosquitoes will have no bugs left to pass on. Five years after the project, Comoros' two islands of Moheli and Anjouan are today considered malaria-free. Officials said that all 16 cases in 2016 were "imported". The island of Grande Comore, where the MDA participation rate was lower than the two islands, recorded 1,641 cases in 2016. The new project, likely to be launched later this year, will build on the popularity of the previous MDA efforts, whose success in containing malaria spread have excited Comoros residents. "In Anjouan and Moheli there is no malaria now ... There are still a few cases in Grande Comore but it has dropped a lot," said Layar Idoine, citing her experience as a doctor having worked on Grande Comore and Anjouan. Also gone with the constant breakouts are the prevalent fears of contracting malaria and the financial burden imposed by the treatment costs on this nation, regarded as among the poorest in the world. "(In the past) Malaria was in the minds of people. When a person is sick, everyone thought it was malaria ... Whenever someone got fever, they went out to buy nivaquine (an anti-malaria drug) and paracetamol," said Idoine. Affane Barcar, chief of Comoros' national anti-malaria program, said that the previous project's success further motivated the Comoros people to eliminate malaria. "Malaria caused the economy to fail. The country's productivity used to be at half mast, and the success rate of children in schools was low because of the absenteeism," he told Xinhua. "Now we see the difference from the years past. We see an increase in success of our students, and attendance in health facilities has decreased by 40 percent." In a 2016 report, the World Health Organization (WHO) listed Comoros as among the six African nations on course to eliminate malaria by 2020. In January this year, Comoros also won the award of the African Leaders Malaria Alliance (ALMA) at an AU meeting in recognition for its efforts to tame malaria. Africa is committed to eliminating malaria by 2030, as articulated in the continent's development agenda 2063. The disease remains Africa's major healthcare challenge, and is estimated to rob the continent of 12 billion U.S. dollars per year in lost productivity, investment and healthcare costs, Moussa Faki Mahamat, chairperson of the AU Commission, said in January. In an interview with Xinhua, He, the Chinese ambassador to Comoros, hailed the anti-malaria project for demonstrating China's medical innovation and its robust cooperation with Africa. The main weapon used in the project is a Chinese-developed drug called Artequick, a new artemisinin-based combination therapy (ACT) that combines artemisinin, piperaquine and a small dose of primaquine. Its main ingredient artemisinin, now at the front of the world's battle with malaria, was discovered by renowned Chinese scientist Tu Youyou, 2015 Medicine Nobel Prize winner, from sweet wormwood, a herb mostly grown in China. "Artemisinin has a swift effect against malaria parasites, while piperaquine has a longer-lasting effect," said Deng Changsheng, a researcher at GZUCM and member of the anti-malaria team. "The combination also makes it less likely to build drug resistance." Li Guoqiao, who led a team to administer the Moheli project, explained that by mass administering that drug in a limited period of time, the real source of the disease will be addressed. "The MDA strategy is like a running match with mosquitoes' life circle. It requires residents to take medicines twice in two months, a period when new mosquitoes will not get parasites; It is also a period that old, infected ones cannot outlive," said the GZUCM professor. Song said the strategy suits the island nation's conditions, including its small population and limited mobility of people. Such innovations are also needed in African nations where traditional methods of killing mosquitoes and distributing mosquito nets failed to work, he said. "There is no fixed solution for malaria, and Comoros is just a good example of that. It tells us that seeing to the local conditions is very important," Song said. 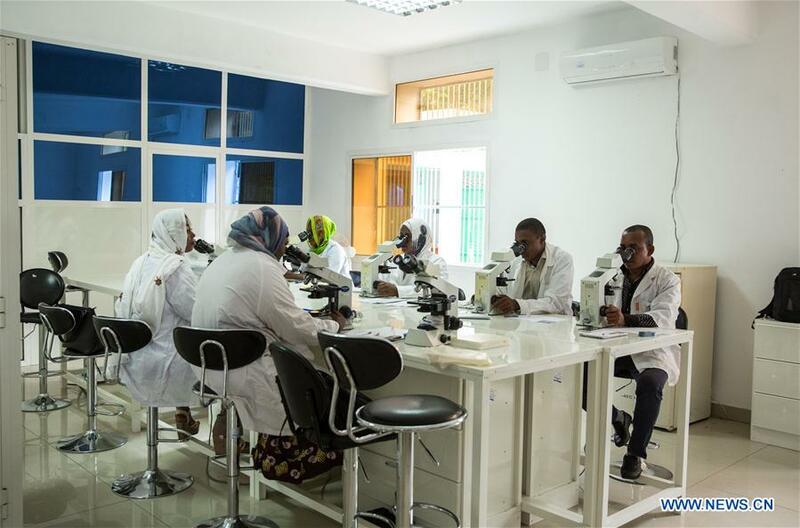 Going forward, the Chinese scientists said they will also strengthen cooperation with Comoros on medical personnel training and anti-malaria capacity building. Deng said such efforts are important if Comoros hopes to maintain its victory against malaria. The good news is that the previous cooperation has helped Comoros build up its own malaria monitoring team. In a lab inside Comoros' anti-malaria center, several local technicians were looking for malaria parasites on purple-colored chips that contained blood samples of local villagers. Beside it is another lab for sampling mosquitoes. Kamal Said Abdullah, a technician at the center, told Xinhua that they go on field trips twice a week to collect blood and mosquito samples from different places of Comoros. "We're closely monitoring the situation. When we detect malaria cases, we will revisit the place and distribute medicines to timely address the issue," he said.